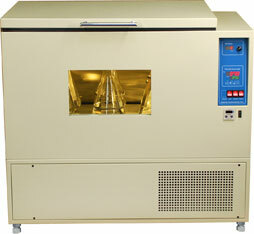 The 767/767R and 777/777R are chest type incubator shakers that are mounted on casters. They feature a front glass window that enables the user to look into the chamber. The 767/767R accommodates a 30"W x 18"D platform while the 777/777R, with a 38"W x 24"D platform, offers the most capacity among all chest type incubator shakers in the marketplace. For example, they can accommodate twenty-four 1-L, fifteen 2-L, or six 6-L flasks. In the refrigerated models 767R and 777R, a chamber temperature as low as 4°C can be maintained. For shaker accessories, click here.